Content management systems have taken web design by storm. Nearly 75 million websites use WordPress, one of the most popular free Content Management Systems (CMS), making up 40 percent of the CMS market share. Still, nearly 70 percent of websites do not use a CMS at all. Many developers view using a CMS as an option for non-technical people. It’s true that designing a website using a CMS does not require knowledge of HTML or any other programming language. However, the advantages of a CMS reach far beyond simply providing a platform for the web design layman. In fact, organizations like Forbes, CNN, Warner Brothers and Sony use a CMS to build and manage their websites. Surely, these large corporations have a fully staffed IT department capable of using coding languages to design their websites. 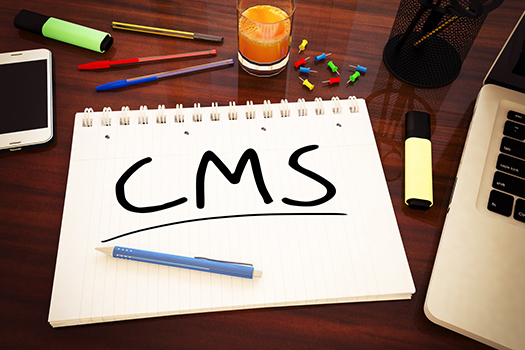 Consider five reasons a CMS is the right choice for any size company with any size IT staff. A successful website, whether an intranet or an internet site, results from the mix of various roles. For example, communication and marketing staff focus on messaging, calls to action and user experience, while IT staff focus on things like functionality and SEO. A CMS balances these roles, making it easy for staff to what they do best, that is to produce content that appeals to their target audience. User experience and quality content are just as important on your intranet as your external website. Your CMS makes it quick and easy to engage employees with relevant, up-to-date news, policy changes or fun promotions. Push important content out in just minutes with the confidence of knowing it will be published in a way that is consistent with the organization’s vision. Businesses can literally complete their design, upload content and launch a new website within minutes when using a CMS. Even the most experienced coder must still take the time to create and organize web pages, images and graphics in the server’s web directory. While there is a level of satisfaction that comes with creating a site from scratch, most coders will admit there is also a level of frustration while you work out bugs and tweak your code for the perfect user experience. Conversely, by using a CMS you get the advantage of using a platform that has been tested and tweaked already. While you may have to live with the architectural decisions of other designers, you get the benefits of being part of a large pool of users, and working with coders that have been required to build in flexibility for hundreds, thousands or even millions of users. Leverage their experience to get your intranet up and running quickly. A key benefit of an intranet is to organize your employee’s activities all in one place. They can communicate, manage projects, find files, get news updates and learn about the company all in one place. A CMS makes this workflow management possible by allowing content to be quickly added and removed. Your CMS gives you the platform to define an effective content creation process. Develop a strategy and define roles based on your CMS. For example, your intranet content creation workflow may involve content authors, editors and a content manager. A CMS makes the process of creating, editing and approving content easy and efficient, creating a truly collaborative process that leverages the assets of all departments. In just a few key strokes, a content manager can see the status of all content, assign tasks, review drafts or give someone else the authority to do so. Let’s say you have an employee blog that is managed through your intranet CMS. The CMS defaults to showing the first paragraph, then providing a “read more” link to continue reading. However, there might be occasions when you want two paragraphs displayed or just one sentence before offering the “read more” link. Add an HTML tag within your text editor to place the link right where you want it. Most CMS platforms allow for similar HTML style and formatting codes that make it easy for you to customize the formatting on just one page. The amount of customization is a critical factor that must be considered when deciding on a CMS. How much customization is allowed? What is the charge if I need customization beyond my skill set? We already mentioned that WordPress consumes 40 percent of CMS-based websites. The next biggest CMS software is Drupal at nine percent usage. However, another 40 percent are built on vendor platforms out of the mainstream. Why? While proprietary CMS software is not free, many times the advantages outweigh the costs. In fact, CMS Report puts “dedicated support” at the top of its list of benefits. Consider this. The most popular CMS platform, WordPress, only employs a little over 200 people to care for millions of users. CMS Report lists “lack of customer support” and “cost of improvements” among the disadvantages of open source CMS software. “Free” software is not free if you must hire support to help you customize. Therefore, it is critical to determine the level of customization and support you will need when selecting a CMS for your intranet or website. A survey of CMS users revealed that 63 percent use their CMS daily for reporting and analytics functionality. One of the most important parts of your content strategy is measuring its impact, even on your company’s intranet. Analytics provide insight into what is important to your employees and how engaged they are. Developing an efficient way to collect data is just one more time-consuming process when you design an intranet without a CMS. An effective CMS enables you to track performance and react accordingly. While using a content management system is not required for running a successful website, it makes the task much easier. Additionally, a CMS makes the continued maintenance and content editing much more productive. Don’t presume that a CMS is just one more piece of software to train employees to use. In fact, the above mentioned survey found that only six percent of respondents say learning to use the CMS was a “major challenge.” The bottom line is that learning the CMS improved productivity with very little learning curve. No organization is static. It is constantly evolving. Likewise, your website and intranet must evolve as well. Maintaining your intranet is key to engaging employees, which directly affects customer service, innovation, productivity, and ultimately profits. Whether you have the technical expertise to code your own website or not, give your business the advantage of a CMS. 59 queries in 0.530 seconds.